Chances are you know someone with diabetes. You might even have it yourself. It’s one of the most common and fastest growing lifestyle diseases today—by one report, 1 in 2 Americans could have diabetes by 2020. It’s a costly disease that can affect other parts of your health—it’s often seen together with heart and kidney disease and if left untreated can even lead to blindness and amputations. It is the sixth leading cause of death. Despite these grim statistics, there is good news. Lifestyle—diet and exercise—are two important factors that can prevent and help manage type 2 diabetes. People with diabetes should work with a registered dietitian (R.D.) to learn about proper eating for diabetes (EatingWell’s 28-day diabetes meal plan, created by an R.D., may also help). As a registered dietitian and associate nutrition editor at EatingWell Magazine, I’ve also come across research on various foods that might boost prevention of this disease. Drinking caffeinated coffee may significantly reduce the risk of developing type 2 diabetes, research shows. The antioxidants in coffee (chlorogenic acid and quinides, specifically) boost your cells’ sensitivity to insulin, which helps regulate blood sugar. In fact, people who drink 4 or more cups of coffee each day may have a lower risk of developing type 2 diabetes, according to some studies. That’s a lot of coffee, so check out these other 4 Health Benefits and Cons of Coffee before changing the amount you drink. There is some mixed research suggesting that cinnamon may improve insulin sensitivity and help lower blood sugar levels. A 2003 study published in Diabetes Care found that type 2 diabetics who consumed as little as 1 gram (approximately 1/2 teaspoon) of cinnamon daily, for 40 days, had lower (up to 29 percent lower) blood-glucose levels than those who didn’t. 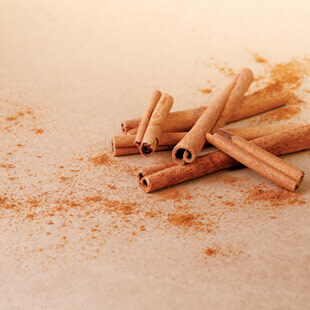 However, more recent research has found no significant effect on blood sugar with the same amount of cinnamon. More research is needed, but small amounts of cinnamon can’t hurt and may help. Selecting whole grains, such as whole-wheat breads and pastas, barley, corn and oats, instead of refined ones can help improve insulin sensitivity. Part of the reason is that they deliver fiber (the recommended daily intake for fiber is 25 grams for women, 38 grams for men). Soluble fiber, in particular (the type of fiber that bulks up in liquid—the kind that’s found in oats, for instance), can help to regulate your blood sugar by slowing down the absorption of sugar from foods. Find out which 6 Whole-Grain Carbs Can Help You Stay Slim.